You’ve built your shed, and you’re proud of your accomplishment. However, if your spouse is like mine, she and your neighbors may not like that yellowy wooden box glaring at them from your backyard. There are a number of options but siding the shed is the best. Shed siding not only improves the look of your shed but also protects the shed and its contents. In this article, I’ll explain different siding options with some pros and cons, factors to consider when choosing a siding, and some installation tips. Hopefully, you’ll have enough information to help make the best decision for protecting your shed. What Does Siding Really Do? The key function of siding is to protect your shed from rain, snow and even ice. It’s the first protective barrier for the framework of your investment against the elements, and also for its contents. The siding also has an aesthetic function, which your spouse and neighbors will appreciate. It gives the shed a finished look and ties it to the other structures on your property. It also looks better than raw plywood or OSB which begins yellowy and fades to a grayish brown before it starts to flake or peel. When choosing a siding, there is a variety of factors to consider before purchasing. Will it stand up to the environment you live in, will it protect your investment, and will it require work after it’s installed, are decision making factors. Water resistant – water damage is expensive, so siding should overlap and protect all seams and joints from even wind driven moisture. Cost – budget is an important consideration, and the siding material and profile affect the cost. Aesthetics – will it blend with your home and neighborhood, or stand out like a beacon of poor taste? Durability – how long will it last and how much maintenance does it require, and will it stand up to the environment you live in. Installation – how easy is it for you to install, do you need special tools, or does it require the pros to install. Maintenance – will it need any maintenance, and if so what kind and how often do you need to patch, paint, stain or replace it? The Building Code identifies what can and can’t be used to build a structure and how it should be built. But, community regulations can add directives and regulations for their jurisdiction. Those local regulations often define finishing materials and structural size. Both of which can affect the aesthetics of a neighborhood and property values. Sheet aluminum or non-galvanized sheet steel except pre-painted factory-baked sheets. It’s easy to check with your local building department and may save you some grief in the long run. There are a number of different materials that are standard choices for siding a shed. Availability, price, and installation cost determine how frequently they are used. Natural wood siding: milled planks in different profiles applied horizontally or vertically, including cedar shakes or shingles that need to be painted or stained. Vinyl: molded colored plastic like material in different profiles applied horizontally or vertically, available in planks or sheets, including a cedar shake profile. It’s doesn’t require painting or staining. 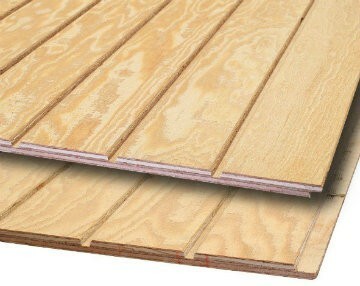 Plywood: manufactured 4’x8’ plywood or OSB sheets, often with grooves cut into one face to look like a plank profile. It needs to be painted or stained. Engineered Wood Siding: manufactured 4’x8’ sheets specifically engineered for outdoor use to withstand the elements. It has an infused color finish, but can be painted or stained. LP SmartSide is an example of an engineered product. Metal: aluminum or steel sheets pressed into different profiles to look like planks or shingles. The color is baked on and shouldn’t require painting. I’ve used all the different standard siding choices on sheds over the years, and I do have a preference. Based on the above “Most Important Factors to Consider…” my personal recommendation is LP SmartSide, with vinyl siding being my second choice. LP SmartSide is designed to be water resistant. It sheathes and sides the shed at the same time, most other siding is applied to a sheathed wall, so although it cost a bit more, you save in the long run. Aesthetically it looks like board and batten. The product is easy to install, resists moisture and insects, so it is durable, and doesn’t need paint or stain – unless you want to. All contribute to my recommendation. Material quantity and cost, plus the installation cost, are highly estimated and depend on how available the product is in your area, and the type and size of your shed. There are different siding options, which give different styles or profiles of finish. They are also influenced by what material the siding is made. For the purpose of comparison in the options below, I’ll use an 8’x10’ gable shed with a 6’ double door opening, one 2’x3’ window in the front wall, and a wall height of 8’-1 1/8”. For more details about average shed wall height reed my post here. Vinyl is a plastic or synthetic material that is molded into different profiles. It’s available in vertical or horizontal planks with lap, beaded, or board and batten profiles, or sheets with a shake, shingle, scallop or scale profiles. Vinyl siding is available in literally hundreds of colors, but availability affects cost. When installed correctly, it provides a durable and water-resistant shell for your shed that doesn’t rot and is resistant to insects. Maintenance is easy, just hose off dust or debris when needed, and caulk or replace damaged pieces. The planks are available in 6” to 10” widths and standard lengths of 12-feet. However, longer lengths are available as special orders (more expensive). Lengths of 16’, 20’, all the way to 40’! The longer length means fewer seams, but increased risk of buckling when being installed. The siding is attached directly to the wood sheathing or to wooden straps that overlay the walls. The planks or panels lock into a starter strip and hide or protect the joint where each sheet is secured. Each row, column or panel locks into the previous one hiding the seam and is screwed or nailed at the other edge. The process is repeated until the wall is covered. A “J”-channel strip is used around doors and windows that the plank end slides into to protect it and keep moisture and insects out. LP SmartSide panels are 3/8” thick 4’x8’ sheets with grooves cut at 8-inch intervals. They look like board and batten when vertical, or shiplap when horizontal. Although LP SmartSide may look like T1-11, it doesn’t crack or have layer separation issues, and porcupines, red squirrels, and other critters don’t like chewing on it. It is also made from a renewable resource in an environmentally friendly SFI certified process, and the Engineered Wood Association has rated it for structurally use. LP SmartSide panels are made similar to OSB. However, the wood strands are immersed in a zinc borate solution and then heated and pressed together with a marine wax mixed with resin glue which makes the panels more resistant to moisture, mold, and insects. The final step is the Smart Guard finish. It’s a resin-saturated overlay which adds further protection and gives the panels a tan-color pre-primed paint finish. It even comes with a 50-year warranty from the manufacturer! Each panel covers 32 square feet and can be attached directly to the studs; acting as both sheathing and a siding in one! To improve adhesion strength, the manufacturer suggests using a construction adhesive on the studs first. Use 2” galvanized nails or 1-1/2” tan coated deck screws and spaced 12-inches apart. The panels lap at their joints. It’s also recommended that all cuts be painted, and openings flashed, trimmed out, or sealed to reduce the risk of moisture damage. To determine the number of sheets needed to side your shed depends on its dimensions. You calculate the square footage of each exterior wall and divide it by 32 (the area covered by one sheet). For each gable end multiply the length by the height and divide by 2. The gable may require fewer pieces, but it depends on the cuts and direction of the grooves. Front and back walls are both 8’-high by 10’-long => 8×10 = 80÷32 = 2.5 sheets per wall, so 5 sheets will do the two walls. Left and right end walls are 8’-high by 8’-long => 8×8 = 64÷32 = 2 sheets per wall, so 4 sheets. Left gable and right gable with a 6/12 slope are 2’-high by 8’-long => 2×8 = 16÷2 = 8÷32 = 1/4 a sheet per wall, so 1 sheet will do both gables. The number of sheets would be => 5+4+1 = 10 sheets @ $34.62 (at my local box store), so the cost to side my 8’x10’ shed would be approximately $346.20, plus the construction adhesive, and any taxes or delivery charges. Sheathing and siding in one! For more information about how to install LP Smartside siding see my post how to build lean-to shed. T1-11 siding is made from thin layers of wood sheets or veneer (plywood) or wood strands (OSB) which are glued and heat pressed and trimmed into 4’x8’ panels. The panels then have grooves routered every 8 inches to give it a board and batten or shiplap look. The 19/32”x4’x8’ exterior grade sheets give a wood look and have been used to side sheds and houses since the 1960s. Both the plywood and the OSB T1-11 panels need to be primed and painted or stained. However, the plywood sheets aesthetically look better stained than the OSB sheets do. They can be finished in a multitude of colors but should be painted or stained every 5 to 15 years depending on your environment. The plywood T1-11 is more expensive than the OSB T1-11 too. When using T1-11 panels, it is recommended that all cuts and openings be sealed, flashed or trimmed to prevent moisture damage and rot. The boards lap at their seams to help protect the edges. Moisture can cause the veneer or strands to swell and separate. Use 1-1/2” coated deck screws or 2” galvanized nails, spaced 12-inches apart to secure the panels. With proper installation and maintenance, T1-11 siding should last for years. To calculate the number of panels needed to side your shed depends on its dimensions. Measure the perimeter (distance around) of your shed and multiply it by the wall height to get the wall surface area. Divide it by 32 (the area covered by one panel) and round up to the nearest full sheet, and you get the number of panels for the walls. The gable needs are determined by multiplying the gable height by the length of the gable and dividing by two. The gables, based on the slope: 2’ (height) x 8’ (length) = 16 sqft.÷2 = 8 ÷ 32 = 1/4 sheet, so 1 panel will do both gables. The total number of panels would be 9+1=10 sheets x 36.48 (cost/panel at my local store) = $364.80, plus trim, flashing, sealer and any taxes. Sheath and side at the same time! Board-and-batten siding has been in use for hundreds of years. It is one of a variety of natural softwood sidings available. It consists of wide planks attached vertically to the wall and smaller strips cover the seams between the planks. It has to be attached vertically to help shed moisture and protect the wood from rot. Since the planks run parallel to the stud framework, horizontal nailing strips or blocks must be attached to the studs, or a solid sheathing attached over the studs first. Originally, planks of no standard width were used on the same structure. Today, boards of uniform width are usually used. Boards are available in 4” to 12” widths and lengths of 8’ to 16’, but can be larger. Narrower boards look better on small buildings like sheds, while wider planks look better on large buildings like barns. Narrower 1”x3” strips or battens are nailed over the seams or gaps where the two planks abut to help keep out the elements, rodents, and insects. To allow for seasonal expansion and contraction, a 1” gap is usually left between wider vertical planks. The wood may be smooth or rough finished. It should be stained, painted, or varnished to protect it from the elements and to prevent rot. With proper maintenance will last more than 30 years – I’ve seen buildings where it has lasted more than 100 years! Once the nailing strips, blocking or sheathing are attached to the stud framework, nail the boards into place vertically with galvanized 2” to 3-1/2” nails. The width of the planks determines the nailing pattern; less than 6” wide should be nailed in the middle, greater than 6” wide should be nailed twice across the middle distance. The battens should overlap each board by at least 1/2” and are nailed in the middle. The nailing pattern allows for seasonal expansion and contraction and prevents the boards from warping or splitting at the edges. The cost of siding a shed with board-and-batten depends on the shed dimensions, plus the widths of the planks used, and the grade of lumber – even 5/4” thick pressure treated deck boards (cheaper than premium or select grade) or fence boards could be used. The cheapest would be recycled boards. For my 8’x10’ shed I could use long planks on the gable walls that are 10’ long and not have a seam to worry about, but more waste. Since the shed is small, I’ll use 1×6 boards and 1×3 battens. So, purchase 8-foot lengths for the front and back wall, and 10-foot lengths for the two gable end walls. 6-inch planks are actually 5-1/2” wide; if I leave a ½” expansion space between boards, I’ll need 2 planks every horizontal foot. An equal number of battens of each length are needed too. The board and batten siding alone would be approximately: $781.76. Add in the nailing strip, bracing or sheathing, plus taxes, etc. and the price keeps climbing. Cheapest option: recycled fence boards. Tongue-and-groove siding is another all-natural and environmentally friendly way to side your shed. The 4” to 6” wide softwood planks (wider planks are available) are milled with a tongue on one edge and a groove on the other edge. The planks lock together with the tongue fitting into the groove, helping to keep the elements and insects out. Both faces are often also beveled where the tongue and groove meet. The bevel is both decorative and helps to shed moisture. The T&G planks are usually 3/4” thick but can be 1/2″ or 1” thick; although thicker planks are available for a price. The planks are usually installed directly to the studs in a horizontal pattern, but can be installed diagonally to the studs, or vertically to strapping or blocking. One face of the plank is often smooth finished, while the other is left rough. Pine and spruce are the most common materials for T&G planks, but cedar and cypress can be had at a higher cost. To install the T&G siding horizontally set the bottom row (starting strip) to overlap the bottom plate and the studs. Use 2-1/2” galvanized or stainless ring-shank nails to secure the planks to the plate and studs. Nail through the face of the bottom plank, about an inch up. At the tongue edge, diagonally drive a nail through just below the tongue. That will allow the groove edge on the next board to cover and protect the nail head. You may need to drill a pilot hole to prevent the tongue from splitting. As one row is completed, continue with the next. You may want to square trim the shed corners to make a tidier finish. The cost to side a shed with T&G pine depends on the dimensions. However, like LP SmartSide and T1-11, it can be nailed directly to the studs, so under-sheathing isn’t necessary. For a cost example, I’ll use my 8’x10’ shed. The 8’ high walls and 2’ high gable roof will be horizontally covered with T&G pine. My local lumber store has 1”x6”x8’ T&G pine in 6 packs for $48.10, one side smooth, the other is rough. Each Board covers approximately 3.34sq.ft. The total surface area of my 8’x10’ shed is: (perimeter x wall height) + (gable height x wall length) = 304sq.ft. ÷ 3.34 = 91 boards ÷ 6/pack = 15 boxes x $48.10 = $729.66 to side with 6” tongue and groove pine. Siding and sheathing all in one! Bevel siding is softwood plank siding that has been milled to look like a wedge. It is also known as clapboard, lap, or weatherboard siding. It is usually milled from pine or spruce but is available in cedar and cypress too. The layers overlap to provide a barrier from the elements, insects, and critters. The planks are available in 8’ to 16’ lengths, but other sizes can be requested. It is often milled from 1”x6”, 1”x8”, or 1”x10” planks and can have a smooth or rough finish. Some bevel planks have a notch rabbeted into the bottom edge so it can fit over the narrow top of the plank below it, allowing it to attach flush with the studs. Bevel siding is nailed directly to the studs using 2-1/2” galvanized ring nails. Use one nail per plank per stud for the 1’x6’, but 2 per stud for the larger planks. Before installing, it may be easier to square trim the shed corners and openings so the siding finishes flush against the corners. Nail the first plank to the studs and bottom plate, then overlap with the next row by 1-inch. Nail through the middle of the plank, not the overlap – this allows for expansion and contraction. Pro Note: Make a “T” stick that hooks under the bottom edge of the installed plank and the leg of the “T” is an inch shorter than the plank face so you can keep the next layer aligned as you nail it. The cost to bevel side a shed depends on the wood used and the dimensions of your building. For my 8’x10’ shed I’ll use ½”x6”x8ft beveled pine plank from my local supplier. At $31.46 for a box of 10 planks and a coverage area of 26.7sq.ft., I’ll need 11 boxes to side the 304sq.ft of my shed. The cost of the pine bevel siding alone is $346.06, plus the trim for the corners and openings. The cost increases with larger plank dimensions and wood type. Channel siding is pine, cedar or other softwood lumber that has a rabbeted groove or lip at the bottom that overlaps the top face of the plank below it. The top edge usually has been narrowed or thinned with a cove, channel or bevel so the boards can be installed flush against the studs when they overlap. The planks can be smooth or rough and have a flat profile, shiplap profile, wedge shape profile, or a rounded profile, so it looks like logs. The siding is available in 1”x6” through 1”x12”, and 2”x6” to 2”x12” material, up to 16’ long. The larger the dimensions and the more select the lumber, the greater the price. For small structures like sheds, the smaller 1”x6” profile is better. You can also purchase pre-primed or stained limber too. Similar to the tongue & groove, and bevel siding, channel siding should have one 2-1/2” galvanized ring nail through its face per stud. The nail should not go through both planks, allowing for seasonal expansion and contraction. The wider the plank, the more nails needed per stud. There should be a 1/8” space between the top edge of the bottom plank and the underside of the bevel or lip on the bottom of the plank above. Make a spacer stick to help maintain the gap as you nail each row. For a neat finish, square trim the corners and openings of your shed before siding. The type of wood, plank dimensions, and the siding profile affect the price, as do the shed dimensions. For the 8’x10’ gable roof example, I’ll use 9/16”x5-1/4”x8’ pre-primed pine channel siding. I’ll need to paint the pre-primed pine instead of staining it, but it is already primed which also means the inside face is sealed. A box of 6 planks at my local supplier costs $63.69 and covers 21sq.ft. To side the shed: 304sq.ft. ÷ 21sq.ft. = 14.47 boxes (I’ll round down due to the door and window openings). So 14 boxes x $63.69 = $891.66 is the cost to side the 8’x10’ shed, plus the trim for corners and openings. Cedar shingles or shakes are usually split from cedar logs, but can also be split from other softwoods too. Cedar shakes resist mold and cracking, but are more labor-intensive than other siding choices. Shakes should be made from trees older than 200 years to avoid knots and curved grain. As the older trees disappear though, cedar shakes will become more scarce and expensive. If you have a bit of time and energy, you can split your own shakes using a froe and mallet. Cut the log to rounds the length of the shingle length you want. Split the round with the froe and mallet and try to keep the thickness consistent. Flip the round after each split to slightly tapper each shake, and get more out of each round. Mill split or taper-sawn shakes are more uniform in size and shape than homemade ones and are even available pressure treated and fire retardant treated. Cedar shingles can have a variety of finished ends. They come in a square cut, fish scale, rounded, octagonal, cove, diamond, hexagonal, arrow, or diagonal depending on the pattern you want. The walls need to be strapped or sheathed, so the shingles have something to attach to. Trim out the corners and all openings, and install drip edge above all windows and doors. Wrap the shed in a waterproof material, and snap a bottom line just below the sill plate. Aline the first shingle with the line and attach it with two 1-1/4” aluminum roofing nails. The nails should be above where the next row will cover. Hammer the nail heads flush with the shingle. Use a level to keep the bottom line level as you add more shingles tight to each other at the bottom. The second layer covers the cracks of the first layer and should sit 1/ 2” below the first later. Snap a string line 5” to 8” up the face for the bottom of the next row, and continue each until done. To side the 304sq.ft. of my 8’x10’ shed using 5”x16” square cut cedar shingles will be more expensive than other options. A box of shingles at my lumber store covers 25sq.ft. and costs $95.99. So…304sq.ft. ÷ 25sq.ft. = 12 boxes x $95.99 = $1151.88, plus sheathing, wrap, and trim for the openings and corners. Aluminum and steel siding is available in most profiles vinyl siding comes in, but is more expensive and has fewer color choices. Corrugated or interlocking steel panels can also be used for shed siding. In coastal areas, aluminum protects against the salt air that can corrode steel or rot wood. Metal siding can have a different, almost industrial, look compared to vinyl or wood. It is usually attached in vertical panels but is also available in interlocking planks that can be attached horizontally, vertically, or diagonally. The shed walls should be strapped or sheathed and felt, or moisture barrier stapled on before attaching the steel or aluminum siding. Install the corner posts and top and bottom J-channels on the walls and all openings, ensuring they’re level. Follow the manufacturer’s instructions for horizontal or vertical installation. Make sure the panels or planks lock or overlap correctly. The cost to side the 304sq.ft. surface of the 8’x10’ example depends on aluminum or steel, the profile and style, and color selected. If finished in aluminum siding: The low end is about $3.00 per square foot up to $6.00 per square foot for the thicker top of the line siding. It’s a shed, so $3.00 x 304sq.ft. = $912.00. Using the same process for steel siding: cost ranges between $4.00 and $8.00. So $4.00 x 304sq.ft. = $1216.00. In addition to the steel, aluminum, or corrugated steel, remember to add the J-channels, sheathing or strapping, and moisture barrier…plus Band-Aids. Here are two other siding options that are inexpensive options. For a board and batten look, sheath your shed with exterior grade 5/8” construction grade plywood. Stain or paint it the color of choice. Use 1”x2” for battens, or rip your own from pressure treated planks. Paint or stain to match, then attach at 8-inch intervals to hide seams and screw heads. Use an adhesive or caulking for added adhesion and protection. Recycled cedar or pressure treated fence boards can be used to side your shed too. They can easily be attached vertically as board and batten siding. Alternatively, with a bit of work rabbeting a channel, they can be installed horizontally as clapboard. Either way, it’s an inexpensive and environmentally friendly way to side a shed. Hopefully, I’ve given you some ideas for siding your shed or helped you make a more informed choice. If you liked the article or have a comment, please let me know. If you know someone who might appreciate the article, pass it on!